Mandap is a traditional and sacred temporary covered-shelter or canopy comprising of four pillars. Indian weddings are more often than not conducted in this. Mandapa / Mandapam / Manavarai in the South. These are used exclusively for weddings or other sacred rituals. It is a covered shelter where the wedding ceremony is conducted. On the Wedding Day, for the shubh or vivaha lagan or mahurat where the main wedding rituals like phera, sindoor, mangalsutra and exchange of garlands (jaimala) take place. These are made-to-order well in advance by suppliers. These can be ordered online too. Though the traditional elements remain same till date, there has been a revolutionary change in the design and style of mandaps. In-fact, the decor varies from each region to region across India. Traditional mandaps are decorated using kalashas (pots filed with water), garlands of mango leaves, coconuts, banana leaves, colorful flowers etc. 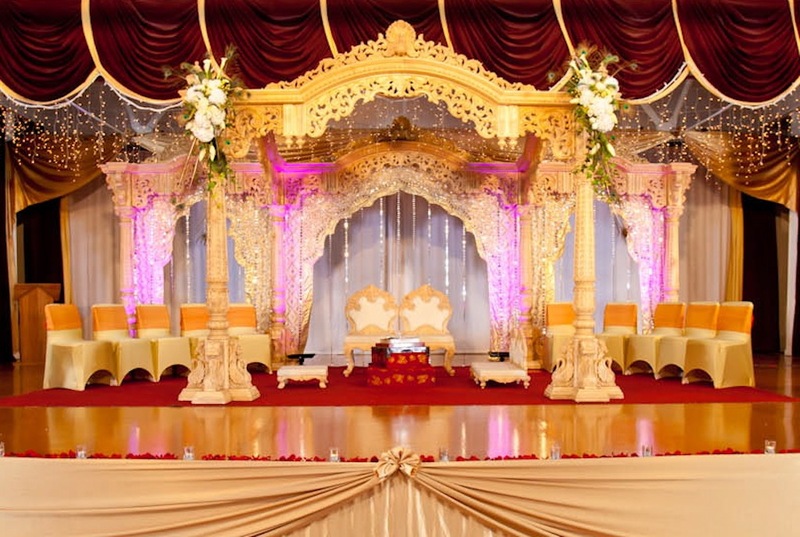 Popular mandap designs include Fiber gold mandap and Flower sankheda mandap which gives a royal and elegant look. These are usually made of wood and pillars are made of bamboo. Wooden Mandaps, Carved Mandaps, Wrought Iron Mandaps and Fiber Mandaps are also common. The height of this is also an important consideration, as it should be minimum eight feet tall. Another, very important factor to consider is health and safety. All the materials used should be sprayed with a flame retardant spray. Fire blankets must be provided as a matter of procedure, all lights and electrical equipments must be re-checked thoroughly. Selecting a mandap has always been an important decision while planning a Hindu wedding. Keeping the wedding theme in mind, this is designed to complement the venue. A well decked mandap adds the required glamor to the wedding. The married life begins underneath the sanctified roof of the mandap. Therefore, choose one that is stunningly beautiful as it speaks volumes about your taste and style as a couple. Creativity combined with practicality will ensure that you take your wedding vows under the mandap of your dreams. A special ritual is held the day before the wedding, to bless the inauguration of this, known as Mandap Mahurat or Mandap Ropan. This has great significance in Indian weddings. According to the Vedas, the four pillars are related to the human life span which is divided into four ashrams or stages. They are Brahmacharya, Grahasta, Vanaprastha and Sanyasa. These ashrams are further associated with the four aspects of life namely Dharma, Artha, Kama and Moksha. The four pillars are also said to be the four parents of the couple without whose love, support and blessings the marriage would not take place. Another variant says that the four pillars which represent the four ages or eras of 1250 years each namely Satyug(golden), Dwapar(copper), Treta(silver) and the Kaliyug(iron). This is also a symbol of the home, where the couple enters together. They are also becoming popular amongst other religions like Sikhs & Muslims.